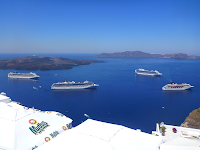 Santofriends: New record in cruise arrivals! New record in cruise arrivals! We have a new record in arrivals of cruise ships, since throughout the day, 7 cruisers will arrive the highest number so far! This means that if you have chosen to move around and explore the island, you should be very careful on the streets, as the traffic will be quite heavy due to the passengers’ transportation. If you also want to visit the Old Port using the cable car, you should probably avoid it, as queues are formed before and after the arrival and departure of the ships. But it is also a wonderful opportunity to photograph the caldera and the ceaseless motion from 12.00 - 18.00, when most of the vessels will be present!